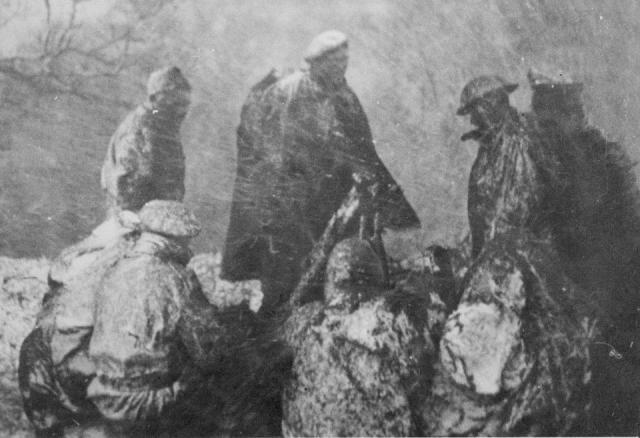 Ever since its unveiling (see photo below) in 1952 by Her Majesty the Queen Mother serving Commandos and veterans gather at the Commando Memorial at Spean Bridge on Remembrance Sunday. A simple service of remembrance preceeded by a short march up the hill, where they are joined by their families and friends, as well as local people. Today the Commando Veterans Association continues to work with local people, officials, and schools, to make this annual event one truly to be proud of and fitting to the memory of all Commandos. To view some images click or touch the photo below. So what was expected of a Commando when they were first formed ? The next page has a transcript of the document written in 1940 by Lt Col Charles Newman VC entitled "Service in a Commando" . This document outlines some of the physical and other attributes required. 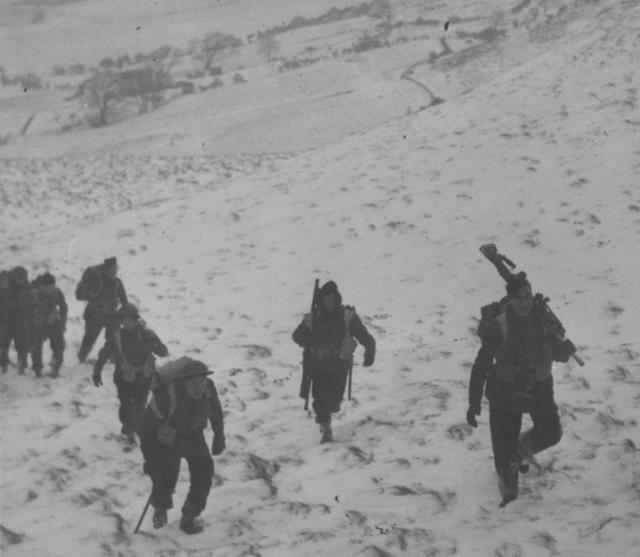 Later you will read about the early Commando training before Achnacarry became the Commando Basic Training Centre, followed by an insight into Commando history since, including what is expected of a Commando nowadays. nb. To view most images in a higher resolution with more detail - click on the image or simply touch it if using a touch screen or smarthone. A Combined Training Centre (CTC) at Inverary [view course dates] and Special Training Centre (STC) at Lochailort (see above photo) had been established. The latter consisted of Nissen huts and tents, with the headquarters installed in Inverailort Castle, about 27 miles West of Fort William. 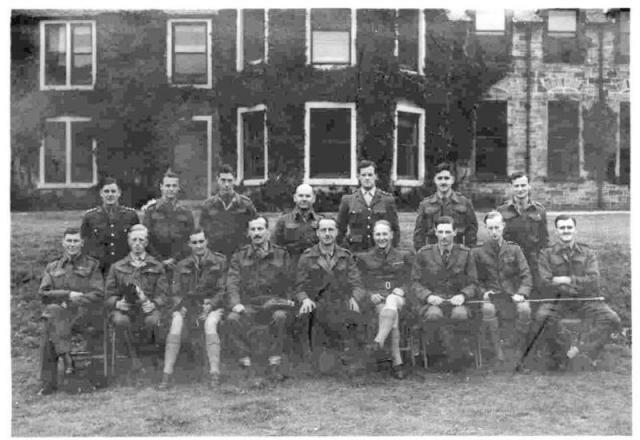 A powerful team of instructors were gathered there, with many going on to became well known leaders of irregular forces, including the Chindits and Special Air Service, all being formed after the Commandos. The Instructors included Lord Lovat, Brigadier 'Mad Mike' Calvert, Colonel Spencer Chapman, Major Peter Kemp, and the Sirling brothers Bill and David. Additionally other officers and nco's with a wide range of experiences from arctic exploring to rugged campaigning on the North west frontier of India, plus those well versed in signalling, demolitions, and shooting. Two of these Instructors were Messrs Fairbairn and Sykes of Shanghai Police fame. These two men, more than anyone else in the British Army were responsible for the introduction of unarmed combat and close quarter fighting. 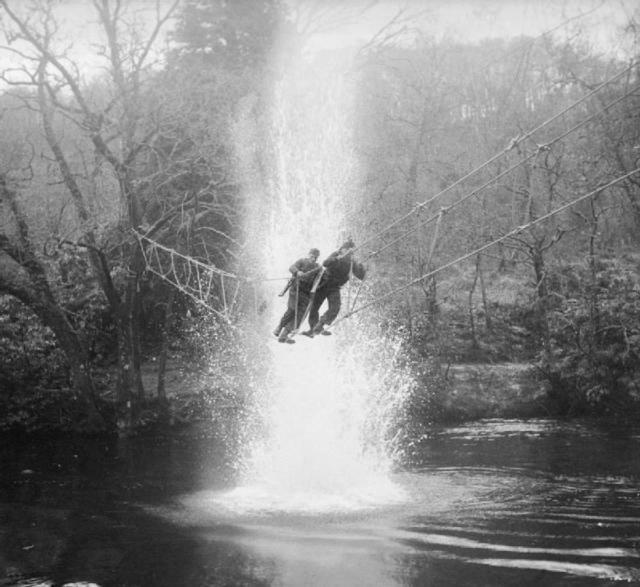 From July 1940 officers and selected NCO's from the newly formed Commandos attended STC courses, and then returned to blend the techniques and skills acquired with the other new ideas being developed within the training regime of their own Commandos. The castle of Achnacarry, and the grounds, was the seat of Sir Donald Walter Cameron of Lochiel, Chief of the Scottish Clan Cameron, who in June 1940 had given hospitality to No 1 Independent Company. In December 1940, Achnacarry, as well as nearby Achdalieu Lodge, were officially brought into use as part of the the new Training and Holding Wing for the main Special Training Centre (S.T.C.) at Lochailort and remained as such for the next year. A decision was made to centralise all Commando training at Achnacarry. In December 1941 Achnacarry was re-designated as The Commando Depot, and passed under the authority of the Special Service Brigade. The first courses began in the months of February/March 1942. 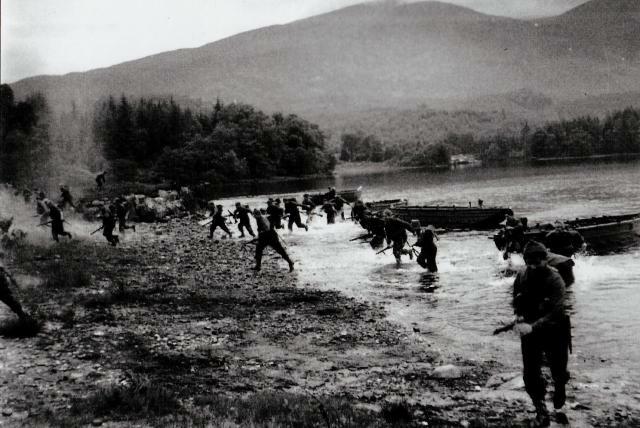 Achnacarry was now the training centre for all Commandos in the UK and was known as the Commando Depot, later renamed the Commando Basic Training Centre [read more here]. The first Commandos were all Army Commandos. Twelve Army Commandos were raised in 1940 and had been involved in operations since then. 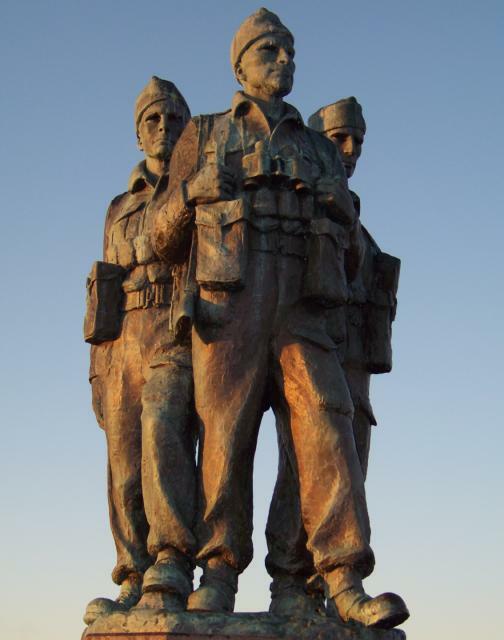 It was not until February 1942 that the first Royal Marine Commando unit was raised. Briefly named The Royal Marine Commando, then 'A' Commando, finally designated with the title of No. 40 Royal Marine Commando, Royal Marines. 40 and the later 41RM Commando would be the only two RM Commando Units raised initially from volunteers as with their Army Commando counterparts. From August 1943 onwards a further seven RM Commandos were raised from disbanded Royal Marines Bn's. All would have to pass the same strict selection and training as the Army Commandos. Those Marines from the disbanded RM Bn's who for whatever reason did not proceed to the Commandos, were posted to other areas in the Corps, primarily Landing Craft duties. View a brief outline on this link to other Commando Training Centres from their formation until the present time. 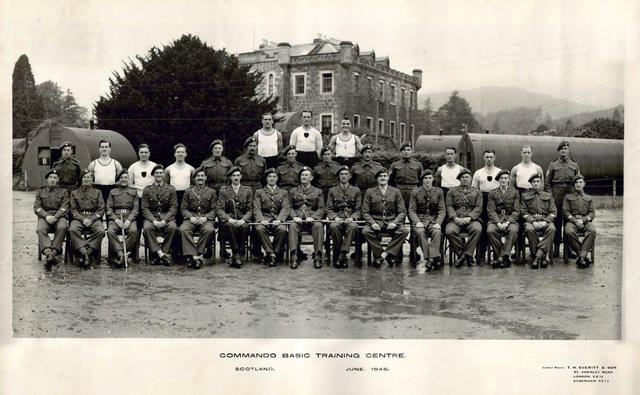 The Commando Basic Training Centre (CBTC) at Achnacarry was regarded as one of, if not, the finest of all the Allied special training centres established in the Second World War. Its reputation was widespread and held in the highest regard by all the Allies, for not only were soldiers and marines of the British forces trained there, but also those from the USA, France, Holland, Belgium, Poland, Norway, and surprisingly, some Germans. These were the ‘Free’ Germans and included Jews who had escaped the tyranny in their own country. Many other Units also used the facilities of Achnacarry. A list of the Courses can be found in our Gallery here [Courses at the CBTC]. Located on the banks of the River Arkaig the castle is flanked by daunting and desolate mountain terrain. Ben Nevis is just 18 miles away and waiting as a final challenge at the end of most courses. In the immediate vicinity of the main building hutted accomodation was erected, amongst which a large multi purpose hut was dominant. The grounds and castle of Achnacarry was the seat of Sir Donald Walter Cameron of Lochiel, Chief of the Scottish Clan Cameron, who in June 1940 had given hospitality to No 1 Independent Company. Commando training was not centralised at this time with each individual Commando unit responsible for their own training. In December 1940, Achnacarry, as well as Achdalieu Lodge, were officially brought into use as part of the the new Training and Holding Wing for the main Special Training Centre (S.T.C.) at Lochailort and remained as such for the next year. A Training Centre was also operating at Inverary. STC Lochailort was however scheduled to be closed. A need had been seen to centralise all commando training with a Commando Course that everyone would have to pass. Thus in December 1941 Achnacarry was re-designated as The Commando Depot, and passed under the authority of the Special Service Brigade. Around the drill square hard asphalt now replaced the green lawn of the Castle. This square was surrounded by austere Nissen huts with their corrugated iron sides and roofs. 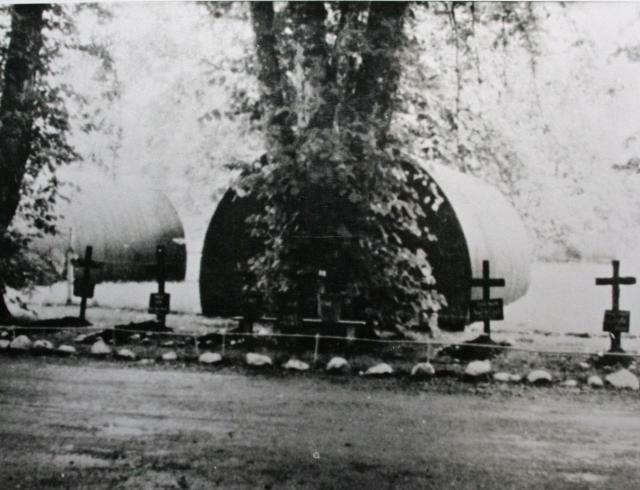 These were the accomodation huts, each housing between 25 and 40 men, and also used as dining 'halls', washing rooms, and the NAAFI canteen. Occasionally these were complimented by Bell tents when additional accomodation was required. 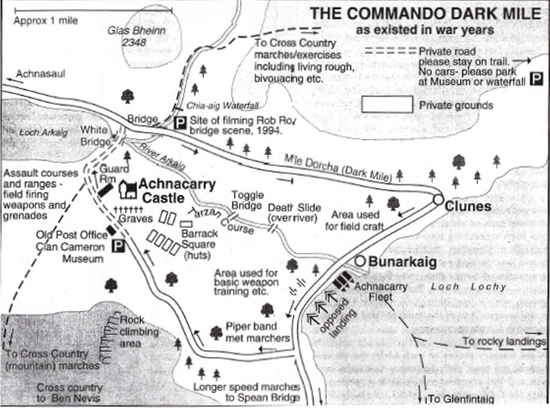 Achnacarry was now the Commando Basic Training Centre (C.B.T.C. 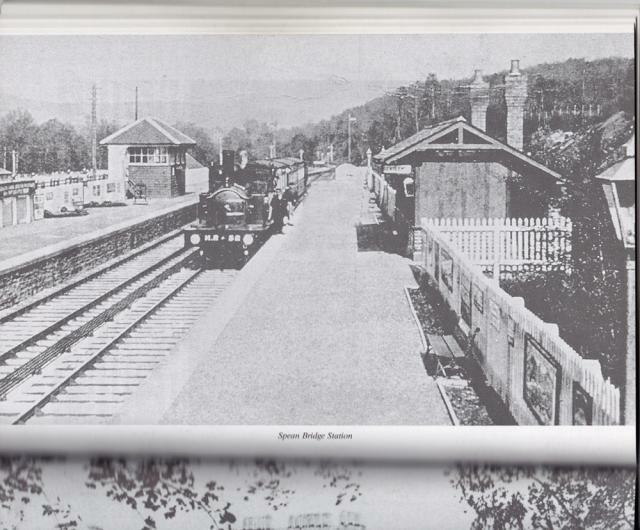 ), however we have found references to the old Depot name still being used long after. 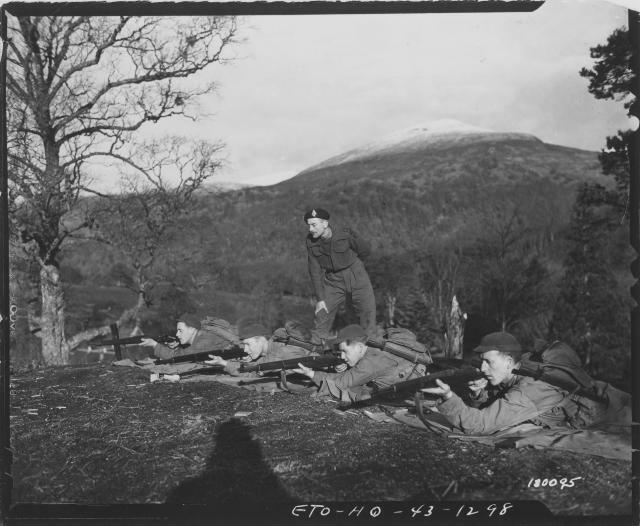 The first of the new centralised training courses took place in Feb/March 1942, and by the time it closed in 1946 more than 25,000 men had passed through the gates of Achnacarry to participate in what was the forerunner of all special forces training throughout the world. Not all the men were Commandos. There were other units that sent contingents to Achnacarry for training. 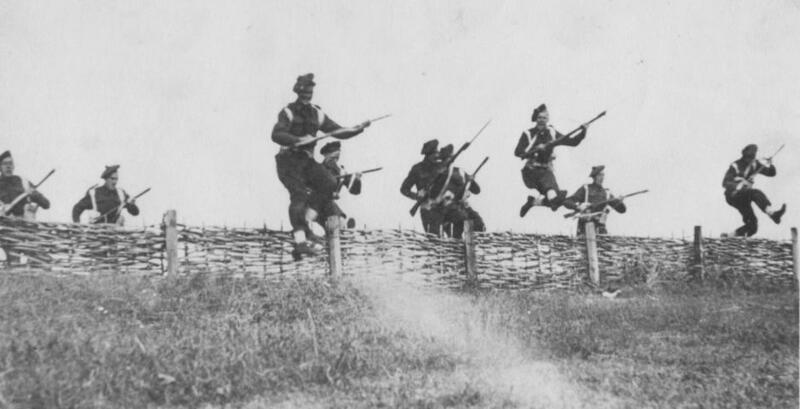 Much of what was taught in these early days is still the basis for Commando training of today. 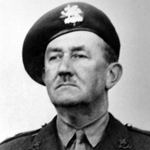 In his book "It had to be tough" Major James Dunning, who served on the staff at the CBTC for a period, states the following, "Normal intakes of trainees were allocated to one of the three training Commandos: Keyes, Haydon or Sturges, named after pioneers of Combined Operations and the Commandos. Admiral Sir Roger Keyes, our first beloved boss, and his son Geoffrey, who won the first Commando VC; General Haydon, the original commander of the Special Service Brigade and leader of the Lofoten Islands Raid; General Sturges, a Royal Marine, who after the Madagascar operation became the first overall commander of the Commando Group of four Commando Brigades. Each Training Commando was commanded by a Captain, with a minimal headquarters of a CSM, a clerk and a storeman. The Commando was organized into four training Troops, each under an instructor-officer, assisted by a Troop Sergeant." 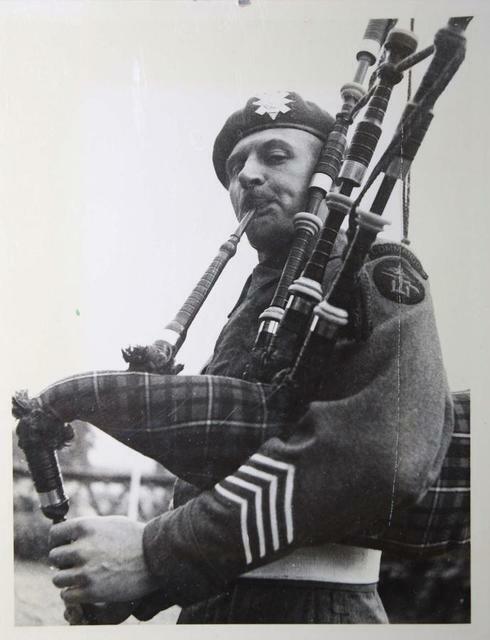 Major Dunning, a member of the CVA, goes on to say that there was a Demonstration Troop to assist Instructors in their training and this troop had a secondary role as the Pipe Band for the CBTC." Much of the PT consisted of agility and strengthening exercises, and teaching the drills and skills of tackling obstacles. All the equipment and obstacles were home made at Achnacarry by the staff. The photo depicts trainees using logs, each about 15-20 feet long, as part of that training. The logs were heaved, hurled in the air, and caught in a variety of different improvised strengthening exercises, demanding in addition, plenty of team work and cooperation. More can be read about other areas of training in the following pages. It would be remiss not to mention the man tasked with organising and controlling such demanding training, Lieutenant Colonel Charles Vaughan. In his book It had to be Tough, Jimmy Dunning says of him " A Veteran of the First World War and the Retreat from Mons in 1914. In the inter war years he graduated from Drill Sergeant to RSM, but he was much more than just a bawling barrack square man, although he could do that if needed. His obvious military potential as an officer was recognised and he was duly commissioned. A Londoner by birth and proud of it, Charlie's standards for soldiers and soldiering were set by his long service in war and peace. He accepted nothing but the best, whether it be in fitness, training, weaponry and musketry, fieldcraft and tactics, drill and turnout, or even in the more apparently mundane matters of administration which included feeding and hygiene. Together all these factors made the 'whole' - and the self disciplined and reliant Commando soldier 'fit to fight' and 'fighting fit' with high morale, willing and capable of tackling any military task, under any circumstances, and against any odds." Follow this link to view the dates of Course Intakes at Achnacarry. Follow this link to view a Roll of Honour for Commando Training Centres. For those selected as suitable for Commando training after Achnacarry became the Commando Depot/Commando Basic Training Centre in March 1942, their arrival by train at Spean Bridge Railway Station has been described in many different ways. Some say they were met by a pipe band, others that they marched in full kit to Achnacarry, others that they arrived on their own. All are true but none set in stone.
" From Crianlarich the train climbed steadily northwards, through scenery that became increasingly wilder and more forbidding. By Tyndrum and Bridge of Orchy, over bleak Rannoch Moor, and on past Loch Treig. A pitiless drizzle was falling as the train finally rumbled down a slight gradient, and clanged and clattered to a halt at a picturesque little station.Above the hiss of steam I could hear the sound of the pipes and - like a ghostly echo of the'45 - a porter shouting in a high pitched, Highland voice: "Spee...ann Prri...dge ! " He goes on to describe a kilted Pipe Major playing the quickstep alongside Instructors who were giving orders on the platform, distinguished by their appearance, wearing camouflaged rainproof jackets, boots and faces shining, their brasses beaten flat and burnished. 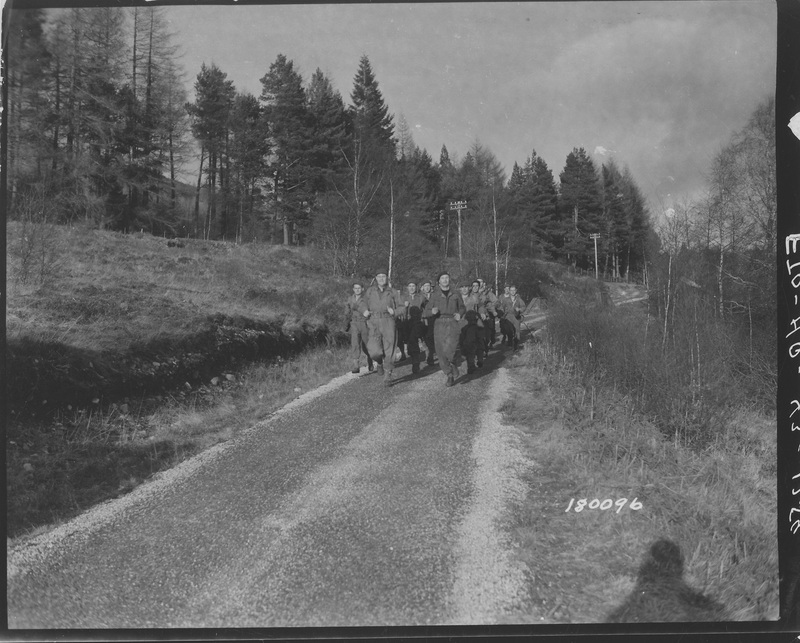 Kit bags were thrown onto lorries but the men were formed up, flanked by Instructors, and with Pipes playing, they marched the seven miles to Achnacarry. Others have described arriving alone in possession of just their kit and a rail warrant, and not knowing where to go, having to ask for someone to phone the staff at Achnacarry who would come and collect them. All would take the same route past the Spean Bridge Hotel, through the village, to the bridge. Marching across the bridge over the Caledonian Canal, then up the steep incline until Achnacarry House loomed into view. The one consolation to all the recruits was that at least the officers had to do it as well ! Stopping at the gate they had time to take in the surroundings. Everywhere you looked men were training. Alongside the trees that lined the driveway was a long row of graves marked by white crosses. Nailed to each was a small board bearing a number, rank, and name, under which was a cause of death. "He showed himself on the skyline", "He thought his camouflage cover perfect", and so on. "They were phoney of course....Or, were they? " 15 miles under 170 minutes, followed by assault course and firing. These times were only basic guidelines with Troop leaders expected to aim for better times according to the fitness of the trainees. On all speed marches everyone was expected to help flagging comrades keep up. All Officers and men were expected to help out in the task of load sharing for flagging comrades. Instructors were tasked with leading by example rather than by bullying. They verbally encouraged and helped the stragglers. 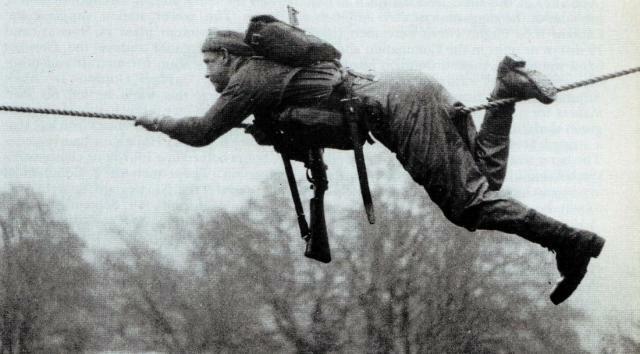 This was a fundamental and significant feature of Commando training. Located in the area between the River Arkaig on the opposite side to Glas Bheinn Mhor past the Chia-aig waterfall and forest (nb. this walk area is currently closed due to hazards). Quite different to speed marching on open road, cross country marching would be better known today in modern Commando parlance as 'yomping'. Even the formation was different. Single file, rather than the columns of three in the speed marches, and led by an Officer or an NCO, on a compass bearing or picking his route from a map. The leader also set the pace. Over heather and swampy moors, through glens and across shallow burns and deep and fast flowing rivers, up and down mountains. In all weathers throughout the year, and with no special clothing or equipment other than standard army issues. Dressed in FSMO and carrying rifles the going was tough. The need for observation at all times was paramount as snipers and ambushes were laid on by Instructors, and as always, live ammunition was used by this 'enemy'. The cross country marches were developed into 36 hour schemes so that the trainees slept out and learnt to make the best of any shelter, or use natural materials to construct simple bivouacs. They also had to cook their own meals and this is where the 'Me and My Pal' system came to the fore. One man prepared the 'bivvy' whilst the other got 'cracking on the grub.' This is where their survival training from Achnacarry's CSM 'Ossie' Moon was put into practice. Alongside the River Arkaig Ossie would describe the basic principles of building to provide shelter from the rain, wind, and cold. How to live off the land, how to procure all kinds of food, animal and vegetable, and prepare and cook the same on a wide range of improvised fires. Located in the area near to Loch Arkaig. More time was devoted to weapon training and firing practices than any other single subject for obvious reasons. This training was the responsibility of the WTO - Weapon Training Officer. Captain 'Wally' Walbridge was the original WTO, followed by Captain Ken Allen, and later Captain 'Spud' Murphy. The basic instruction consisted of a thorough revision of Rifle, Bren gun, Thompson sub machine gun, Boys anti tank rifle, Piat, Revolver, and Grenades. Followed by plenty of handling practices and lots of firing. 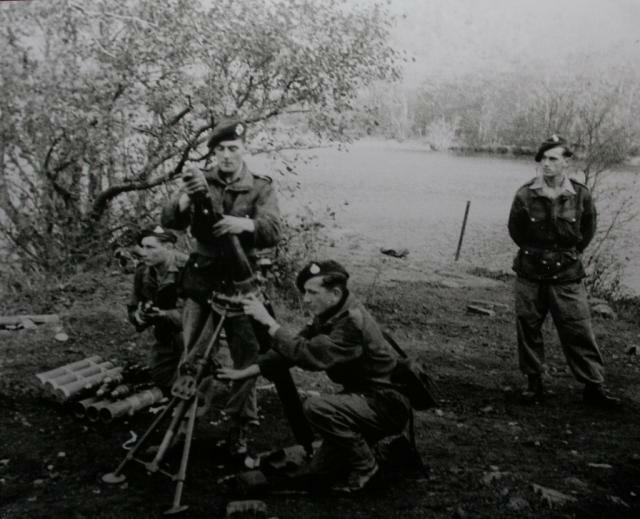 Some introductory instruction was given on the heavy weapons such as the Vickers MMG and the 3" Mortar, but it was elementary as more detailed instruction on heavy weapons was given at the Holding Operational Commando, or once at their operational Commando, if and when they passed their basic training at Achnacarry. They were also given instruction in the use of enemy weapons, and those of our major ally, the USA. Basic instruction on mines and demolitions was also given, but it was basic, as specialist demolition courses were available elsewhere for Commandos when needed for specific missions. This consisted of what was known as the Death Ride and the Toggle Bridge Both were located along the banks of the River Arkaig between Achnacarry itself and the Boat House at Bunarkaig. The toggle rope was a piece of equipment all commandos carried. About 4 feet in length it had a piece of wood at one end and a loop at the other. It was a simple matter to thread the wood between the loop. If needed several could be joined to gether to form a chain as an aid to scaling walls. Many could be linked together to form a toggle bridge strong enough to support half a dozen men and all their equipment at a time. 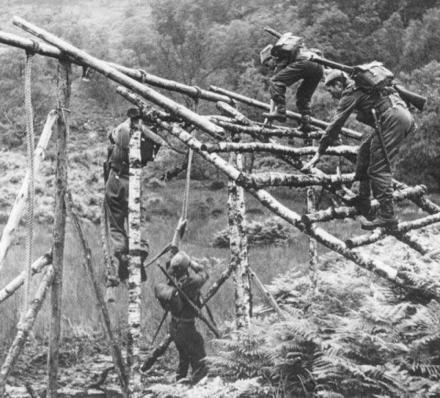 As part of the training a toggle bridge was set up between the two banks of the River Arkaig. The Death Ride or as later some called the Death Slide was the idea of Lt. Alick Cowieson, nicknamed Alick Mor (Alick the Mighty), who at the time was an instructor at Achnacarry. One end of a climbing rope was tied to the top of a tree on one bank of the Arkaig, with the other end tied to the base of a tree on the other side. The rope was then pulled taut. A distance of about 50 feet across the river, the descent being from a height of about 30-40 feet above the river. The recruit would then climb to the top of the tree, thread the wooden peg of his toggle rope through the loop thus making a complete circle of rope. This was then placed across the rope that was stretching across the river. so that the two loops at the end of the toggle rope now dropped on either side of the outstretched rope. Putting their wrists through the loops and twisting them securely and then holding onto the toggle rope above. Then by kicking with their feet against the trunk of the tree they were off. The remainder of the tarzan course consisted of ropes spread across the tall beech trees in the wooded area linking each at heights of about 30-40 feet. On these the men would learn cat crawling - torso flat on a single strand of rope with one leg extended backwards and the foot positioned over the rope, the other leg dangling down for balance. Then making your way along the rope. Additionally there were grappling nets set up where recruits would swing from a rope and let go to fall onto the grappling net. Located between the banks of the River Arkaig and the area on the map marked Clunes. The primary brief for Instructors was to provide expert instruction on movement over all types of terrain by day and night, the use of ground cover to avoid detection by the enemy, camouflage and concealment, and methods of locating the enemy with both 'eye and ear'. The instruction was given by an Officer and 2 NCO's assisted with paractical demonstrations by the Achnacarry Demonstration Troop. The latter doubled as the CBTC Pipe Band ! It would be impossible to describe the training involved in a paragraph here. The Officer instructor in Field Craft during his time at the CBTC was James Dunning and he details this and all the other types of instruction givem at Achnacarry in his excellent book 'It Had to be Tough' - a must read for anyone interested in Commando training. 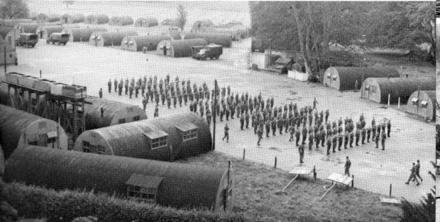 Training in unarmed combat and close quarter fighting took place near the main camp by the Nissen huts. At STC Lochailort this type of instruction was based on the techniques of Messrs Fairbairn & Sykes. At the CBTC training was delivered by the PT instructors Sgt Stanley 'Sonnie' Bissell and and Sgt Roy Bellringer, and led by CSMI Alex Frickleton. Bissell, one of the first of the Police intakes to the Commandos, was accomplished in the art of boxing, wrestling, and judo. 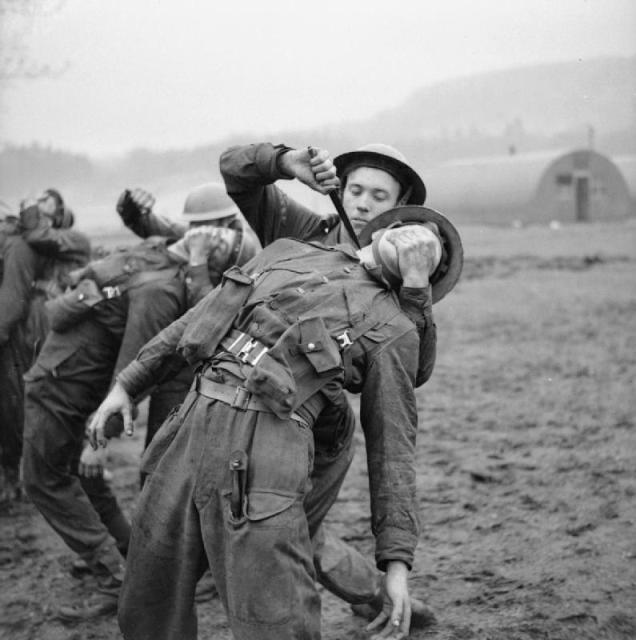 Photo depicts training in the use of the Commando fighting knife. Elementary watermanship in the folding boats, canoes, and rubber dinghies followed with the correct handling and use of paddles and oars for steering and propulsion.Once these fundamentals had been mastered it was onto the normal craft for operational landings, the assault landing craft, concluding with the opposed landing. The Boating Officer from 1943-45 was a Royal Marine officer, Jim Keigwin, a most competent and first class instructor, and an excellent organiser, with his fleet ever ready and in good condition. 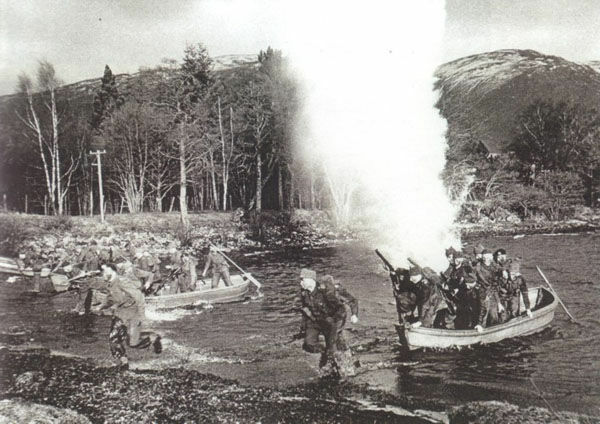 The night assault landing is described by Donald Gilchrist in his book Castle Commando as " By far the most spectacular of all the Achnacarry training schemes." He goes on to say that it was as close to battle conditions as they could get without actually slaughtering half the trainees. 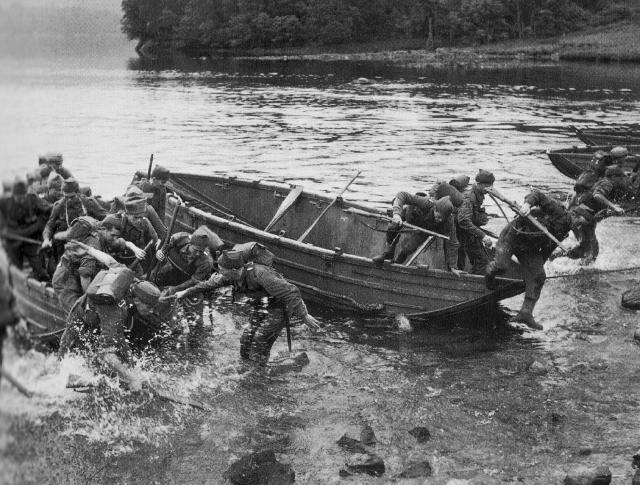 The trainees were loaded into boats at Bunarkaig, they then rowed or paddled - depending on the type of boats employed - across the waters of Loch Lochy, and carried out a mock attack against a heavily defended section of the shore of the Loch. It may have been a mock attack but was certainly not a mock defence. The attack route was carefully planned and determined. Any deviation from it would put the trainees in grave danger. They were confronted by an arsenal of weapons manned by an army of instructors skilled in the Achnacarry art of shooting to miss - but not by very much". There was no blank ammunition used. "The weapons of defence, from the mortars to the rifles, spatout live stuff - and spat it out in vast quantities". "This Reunion, held over the weekend 24th-26th September, was an unqualified success, and, congratulations are due to the hard work put in by Slim Sutherland, Jim Smith, Peter Dietz, Mike Banks, Ken Broom, Jack Hunter and C/Sgt. Tony Boyle (currently serving with RM Mountain and Arctic Warfare Cadre) were well rewarded. The purpose of the reunion was to commemorate the 50th Anniversary of the original Commando Mountain Warfare Training Centre's (CMWTC) move from Llanwryst to St. Ives in 1943 and for all those commando comrades who subsequently served there during the period 1943 to 1950. As such, it was, of course, a unique reunion, including not only wartime members of our own Commando Association, but also those post-war RM Commandos of the Commando Cliff Assault Centre (CCAC) and its Successors. As a result, it was natural that the number of original CMWTC veterans would be outnumbered by latter day RM Commandos. This was inevitable, but only enhanced the occasion and provided evidence of continuity. Unfortunately, because of ill-health, neither Geoffrey Rees-Jones, a pioneer Commando climber who commanded CMWTC when it moved to St. Ives, nor the legendary Commando climber, Capt. Joe Barry, were able to attend, but two others of that move 50 years ago were, Major Jim Fraser who also commanded CMWTC and CSM George 'Dickie' Dicks, BEM. One of the features of the weekend was a demonstration by today's direct descendant of CMWTC, the RM Mountain and Arctic Warfare Cadre, They put on impressive demonstrations of abseiling from a helicopter and a cliff assault. On Saturday evening, the main event of the re-union, the official Dinner for the ex-Commandos and their families, was held in the St. Ives Rugby Club. Just on I00 comrades and guests sat down to the meal. Piper Bill Millin was in attendance. 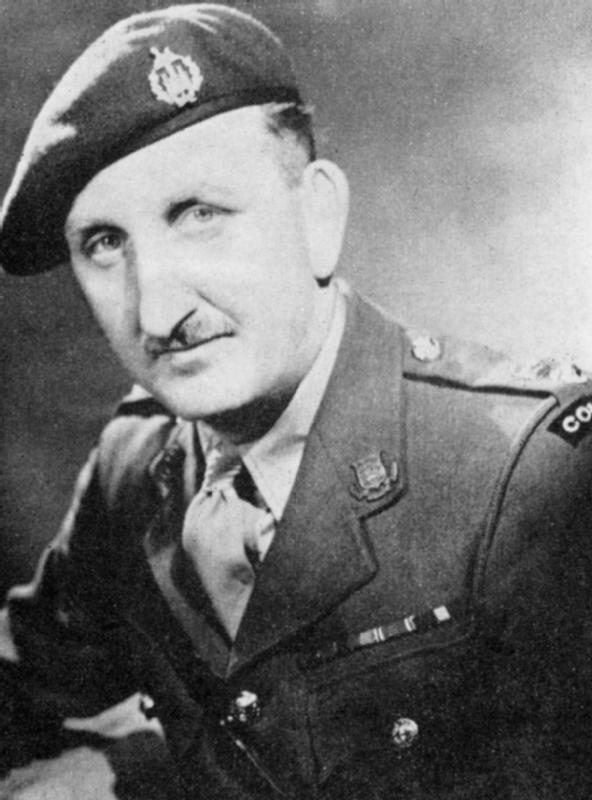 As guest of honour, Major Jimmy Dunning, who was the last Adjutant of the CMWTC, and subsequently on renaming, the first Adjutant of the post-war CCAC, recalled the unique spirit of the unit that survived the traumas of the 'demob-happy' days of 1945 - 46 and the fight that Major Easton, MC (then CO) had to ensure that the techniques of Commando climbing and rocky landings were preserved by the survival of the unit in peacetime. He also recalled 'Commando Week', June, 1946, when the unit appealed to the locals and holiday makers through a week-long series of events for £1,000 for the Commando Benevolent Fund. He reminded his listeners that they succeeded in raising that sum, which today equates to at least £125,000. Not a bad effort for a Unit of about 50 all ranks. The weekend reunion ended with a simple but moving open-air service at St. Nicholas Chapel, the Island, St. Ives, and this was conducted by the Revd. Richard Baxter, who in 1945 - 46, served in CMWTC. Among those who attended were Capt. Mickey O'Brien, who flew in from Malta and Glyn Vaughan, who made the long journey from Australia." Follow this link for early training including CTC Inveraray and STC Lochailort. Follow this link for the Commando Basic Training Centre. View our Gallery Images of Commando Training. ​Follow this link for Cliff Assaults. Centre for the formation and training of RN Commandos from 1942 until 1945. Based at the War Office requisitioned Glenfinart House Ardentinny, close to Loch Long, and designated from October 1942 as HMS Armadillo. This arduous course was for junior Officers and senior NCO's. One of the Rifle Instructor's there was Tasker Watkins, who was later awarded the Victoria Cross serving with the Welch Regiment after D Day. The course culminated in a section race over Mount Snowdon. Many Commandos attended this course whilst based at the Holding Operational Commando at Wrexham awaiting operational posting. This link takes you to a comprehensive list of Combined Operations Training Centres. RSM of The Buffs (East Kent) Regiment from 1926 - 1935. Promoted Lt Col. to take up post of Commandant at the Commando Depot 1942. In his book It had to be Tough, James Dunning says of him " A Veteran of the First World War and the Retreat from Mons in 1914. In the inter war years he graduated from Drill Sergeant to RSM, but he was much more than just a bawling barrack square man, although he could do that if needed. His obvious military potential as an officer was recognised and he was duly commissioned. A Londoner by birth and proud of it, Charlie's standards for soldiers and soldiering were set by his long service in war and peace. He accepted nothing but the best, whether it be in fitness, training, weaponry and musketry, fieldcraft and tactics, drill and turnout, or even in the more apparently mundane matters of administration which included feeding and hygiene. Together all these factors made the 'whole' - and the self disciplined and reliant Commando soldier 'fit to fight' and 'fighting fit' with high morale, willing and capable of tackling any military task, under any circumstances, and against any odds"
Post war he was associated throughout the remainder of his life with The Old Comrades Association of the Special Service Brigade, later amended to the Old Comrades Association of the Army Commandos (The Commando Association). It was formed on the 20th June 1943 at the Commando Basic Training Centre at Achnacarry by Lt Col Vaughan, who as Founder Member was given membership Number One. 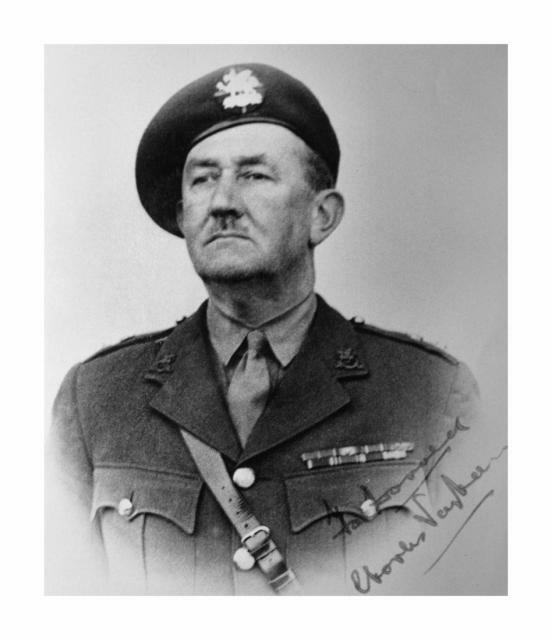 Lt Col. Vaughan was President of the Commando Association during the years 1947/48, 1953/54/55, and 1963/64/65. He was also involved in the formation of the Commando Benevolent Fund to assist or benefit persons who have served at any time in the Army Commandos or being dependents, wives, widows or issue of such person, being in need of assistance. On June 6th 1964 during the ceremonies in Ouistreham commemorating the 20th Anniversary of the D Day Landings, the Commando Memorial window at the church of St Sampson was unveiled by Lieut. Colonel Vaughan. The window had been donated by the Association to the people of Ouistreham as a token of appreciation for their continued hospitality and kindness to Commando Veterans attending D Day Anniversaries. In January 1965 Lieut. Colonel Charles Vaughan OBE represented the Association at the funeral service in St Paul's Cathedral for Sir Winston Churchill. Donald Gilchrist in his book Castle Commando wrote a forward note to the 'Colonel'. He ends by saying, " But it is to you, Charles, that we who counted it an honour to serve you, wish to show our appreciation. You made us fit to fight. You taught us the art of living in a world at war, and to laugh in the most perilous circumstances. What we were - if we were anything - we owe in great measure to you." An hour long film made for the Admiralty in 1945, this is a drama-documentary covering Commando training in Wrexham, Achnacarry and St. Ives. Fascinating archive footage shows wartime Commando units on amphibious assault exercises, perfecting cliff-top assaults and practicing both armed and unarmed combat techniques. As said above the film was made for the Admiralty. The viewer should be aware that the first Commandos formed in 1940 were in fact all Army Commandos. It was not until 1942 that the first two RM Commando units were raised, followed by 5 more in Aug 43, with the last being raised in 1944. 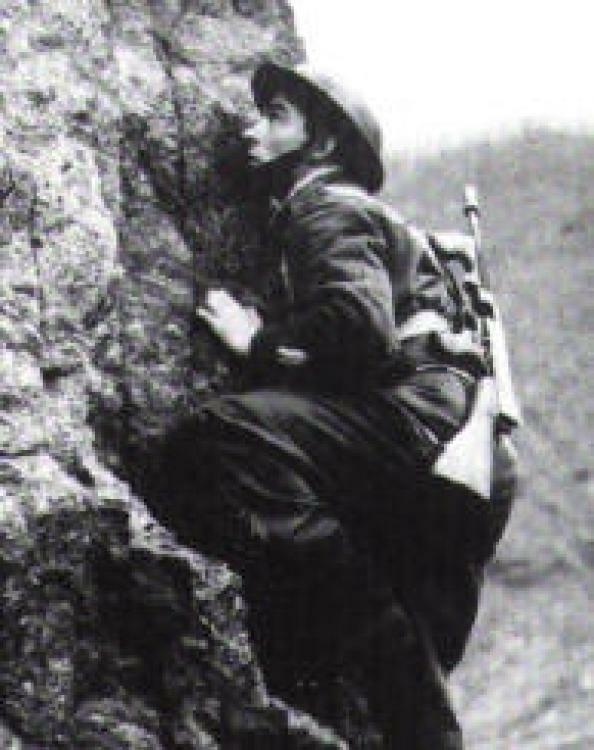 In 1946 all the Army Commandos were disbanded, along with five of the eight RM Commando Units. It would not be until many years later that Army Commandos would return to support the RM Commandos of 3 Commando Brigade. If you have come to this film page first and want to know more about the history of the training, then go the start of the Commando Training section HERE. 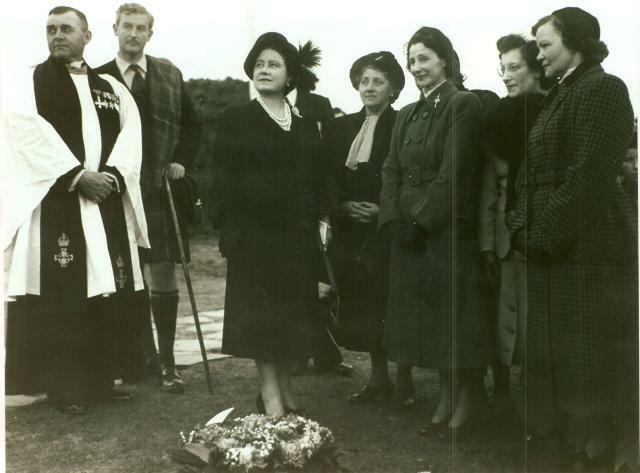 The Memorial at Spean Bridge was unveiled by Queen Elizabeth the Queen Mother on Saturday 27th September 1952. There was no parade or ceremonial drill. The Queen Mother expressing a wish to walk through a line of Commandos on the way back to her car.